There are common requirements when you're shopping for tights such as comfort and durability. Then of course there are some style accentuations that will be pleasant to have as well. Falke understands these needs and delivers a fantastic product that has cultivated a loyal core group of shoppers worldwide that continues to grow each day. A pair of Falke tights is the perfect choice for when you need to combine it with office attire or a beautiful dress for date night. 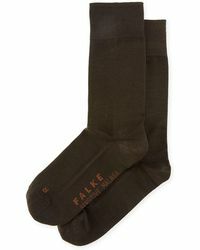 The versatility of day to nightwear and rugged durability of the tights is why Falke is so good at what it does.